It does seem as though we are moving slowly but surely in the direction where everything comes together, doesn’t it? I am talking about the world of consumer electronics here. Back in the day, one had to carry a mobile phone to make and receive both calls and text messages, while there is the PDA for us to electronically keep tabs of our appointments and such, with a MP3 player or portable media player to handle our on-the-go entertainment needs, and a digital camera to snap photos for memories in the years ahead. Fast forward to this decade, and a smartphone is able to do all of that, and then some. However, most smartphone speakers aren’t all that great to begin with, which is where the $49.99 Smartphone Induction Speaker comes in. 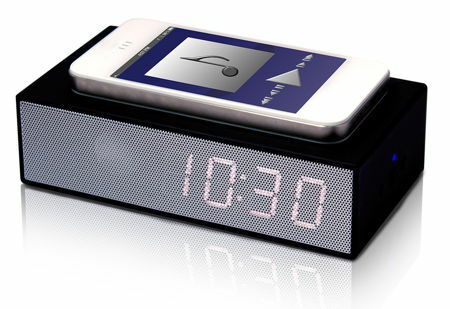 Basically, the Smartphone Induction Speaker with an alarm clock function will be able to amplify audio playback from your iPhone, Galaxy or other Android smartphone, is fully rechargeable, and does not require any kind of prior setup so that you can get started right away. Not only that, Bluetooth and Wi-Fi connections are not required – all that you need to do is place your smartphone on top of it, and play whatever tunes your ears fancy. Music will be amplified across an entire room, thanks to a pair of high-quality 2-watt speakers and a digital clock with alarm. A full charge would enable it to handle up to 15 hours of non-stop playback.